Will 'made in India' be problem for Mahindra? Dealer Andy Jones, who is readying his Mahindra showroom, doesnt think people will have any problem buying pickups made in India. Here are details on Mahindra's emerging U.S. dealer network. 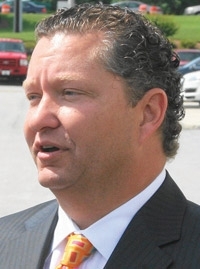 U.S. distributor: Global Vehicles U.S.A.
Andy Jones, an auto dealer who plans to sell Mahindra pickups in Augusta, Ga., takes comfort in a new study that says American consumers appear to have no problem with the idea of buying a vehicle made in India. The family-owned Gerald Jones Dealer Group just finished gutting and doubling the size of a storage building to turn it into a 10,000-square-foot Mahindra dealership. It is adjacent to the group's Honda, Volkswagen, Audi, Volvo and Subaru stores. "I don't think people will have any problem with where the trucks are built," Jones says. "When I first got involved in this, I didn't know much about them either," Jones admits of the Mahindra brand. "I had my own questions at first. But now I think we're sitting on something." Jones is one of 330 U.S. dealers whom the independent distributor Global Vehicles U.S.A. Inc. of Alpharetta, Ga., has signed up to sell compact diesel pickups from Mahindra & Mahindra Ltd. of Mumbai, India, early next year. It is Mahindra's first entry into the U.S. auto business, though the company has sold tractors here under that brand for years. Jones is waiting for furniture to be delivered to his new store. Among the standardized dealership furniture developed by Global Vehicles is what Jones calls a "heritage wall." It is a 24-foot information and entertainment center that displays photos and videos of Mahindra's history as a vehicle maker to tell potential customers that Mahindra is at least well-established in India. Industry marketing firm AutoPacific has published a new consumer attitude survey that offers encouragement to Mahindra dealers. The survey asked 32,000 recent vehicle buyers whether they would consider buying a Chinese- or Indian-brand vehicle for their next purchase, even though no such brand currently exists here. Eleven percent of the group said yes to India; 15 percent said yes to China. That might not sound like a large percentage, says Dan Hall, AutoPacific vice president. But it comes close to the 16 percent of survey respondents who said they would consider buying a Korean-brand vehicle. "And the Koreans have been here 20 years," Hall notes. "There isn't even an Indian brand or a Chinese brand on the market here, and yet almost as many people are open to them as are willing to consider Hyundai and Kia. "I'd call that some potential competition." Chip Bennett will put the numbers to the test when he begins selling Mahindras next year at a new store in Sarasota, Fla.
"I don't think people care where cars are built," says Bennett, general manager for Sarasota Land Rover dealer Jack Urfer. "I honestly believe Mahindra will do what Hyundai and Kia have done." Bennett is overseeing the final touches on the construction of Urfer's new store for the Mahindra brand. Bennett estimates construction costs for the 1,500-square-foot store at between $500,000 and $1 million. The building is complete. He is waiting for the store's furniture. Bennett notes that the Land Rover brand is now owned by Indian billionaire and Mahindra competitor Ratan Tata. Tata's company, Tata Motors Ltd., also owns Jaguar. Earlier this year, Tata said that he wants to begin selling his ultra-inexpensive India-made small car, the $2,500 Nano, in America within two years. "I hope he does," Bennett says. "I'd love to sell that car here."